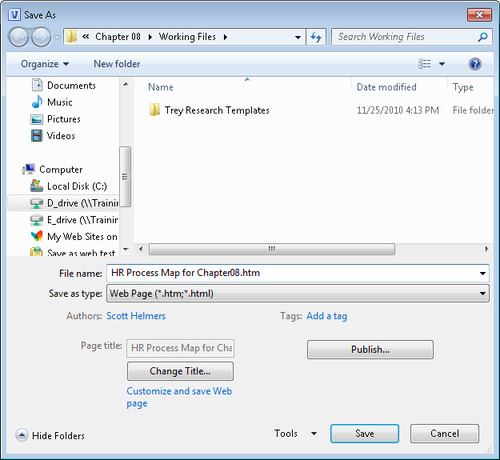 If you haven’t explored the Save As Web Page option in Visio, you owe it to yourself to do so. Whether you want to share drawings on your intranet site with colleagues who don’t have Visio, or publish diagrams on the public World Wide Web, this Visio feature can make your diagrams more accessible. In this exercise, you will create and explore a website generated with default Visio web publishing settings. In the Save as type list, click Web Page. After you select Web Page, the bottom of the Save As dialog box changes to offer additional choices related to creating a website. For this exercise, you will accept the default settings that lie behind the Change Title and Publish buttons. 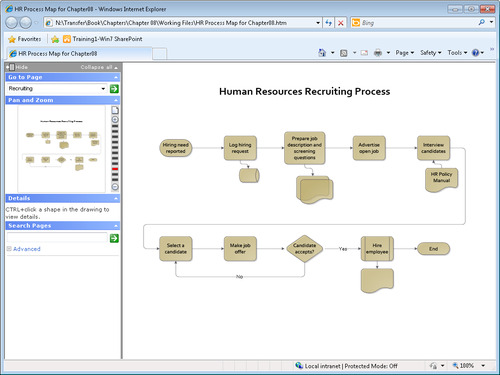 The Change Title and Publish buttons do not exist in the Standard edition of Visio 2010. Click Save. One or more progress indicators appears. Your Visio-generated website appears automatically in Internet Explorer. In addition to a viewing pane, notice the four-part navigation pane on the left side of the browser window. The website produced by Visio uses software that does not work well in browsers other than Internet Explorer. In Firefox, for example, you will see the image of each page, but the additional capabilities described in the remaining steps of this exercise will probably not be available. Consequently, even if you use Firefox or other software as your primary web browser, you will want to view your Visio-created websites in Internet Explorer. For the best browser viewing experience, you need to install Microsoft Silverlight. Information about Silverlight is available at www.microsoft.com/silverlight/. If you do not install Silverlight, you will have fewer viewing options. Click the Hire employee shape. Internet Explorer follows the hyperlink to the subprocess page. Click the browser’s Back button to return to the first page. Click the Advertise open job shape. This shape contains a hyperlink to monster.com, so that webpage appears. In the Go to Page section of the navigation pane, click the down arrow, and then click Hiring part 2. Finally, click the green button containing the white arrow to go to the page you’ve selected. The viewing pane displays the selected page. 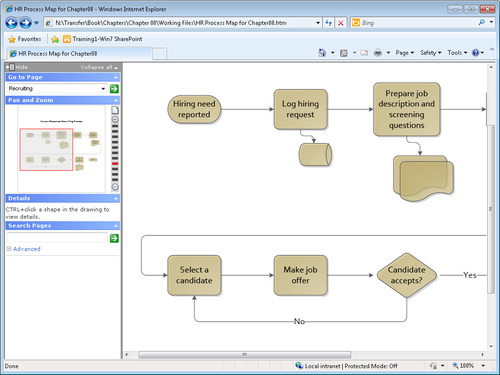 In the Pan and Zoom section of the navigation pane, drag from the upper-left edge of the Hiring need reported shape to the upper right of the Prepare job descriptions and screening questions shape. As you drag the cursor, you’ll see a blue box appear; it will follow your cursor to the right and will also expand downward. When you let go of the mouse, the box you’ve drawn turns from blue to red and the viewing pane shows just that portion of the drawing page. You can’t control the shape of the box you draw in the Pan And Zoom pane. It will maintain the same aspect ratio as the viewing pane to the right. With Internet Explorer opened to full screen on a system with resolution of 1024×768, the result looks like the following diagram. After you’ve drawn a zoom box, you can drag it left, right, up, and down within the Pan And Zoom pane to move the image in the viewing pane. You can also click the buttons and bars at the right edge of the Pan And Zoom pane to zoom in or out. In the upper-right corner of the Pan and Zoom pane, click the icon that looks like a piece of paper to return the viewing pane to full page view. Hold down Ctrl and click the Hire employee shape. The shape data for this shape appears in the Details pane, which is located just below the Pan And Zoom pane. 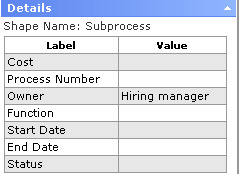 In the Search Pages pane, type candidate, and then click the arrow in the green square to execute the search. A list of all shapes that contain any form of the word candidate appears below the search box. What is particularly impressive about the full text search is that it presents more than just a list; it creates a hyperlinked list of search results, as you will discover in the next step. Click the Select a candidate link in the Search Pages pane. Notice that an orange arrow appears over that shape for several seconds to show you exactly where on the page your search result is located. Try clicking the other entries in the search results list to see that the arrow points to each of them. In the Search Pages pane, type manager, and then press Enter to execute the search. 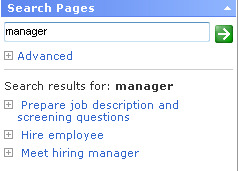 At first glance, the search results look incorrect because two of the three listed items don’t contain the word manager. However, it’s important to understand that the search function is looking at the shape data inside the shapes as well as the text on the shapes. Consequently, if you click the first or second entry and then hold down Ctrl and click on the designated shape, you’ll see that the shape data in the Details pane does, indeed, include the word manager. You can also see the shape data associated with a search result by clicking the plus sign to the left of the search result. Click Meet hiring manager in the search results list. Even though the designated shape is located on another page, the target page will first appear in the viewing pane and then the orange arrow will appear. 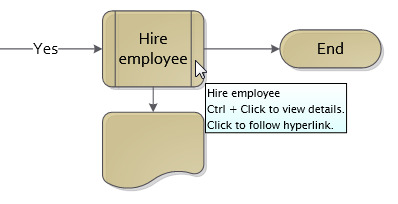 There is a known issue in the interaction between the network and computer shapes in several Visio stencils and the Save As Web Page function in Visio 2010. If you save a drawing containing those shapes to the web, the text in those shapes will not be found by the full-text search function, even though it should be.